hi Ryan, now you have the link to https://canalplan.org.uk/ you can open another tab to google maps and explore the likely mooring places suggested by your entered number of days and hours cruising per day criteria, zoom into the canal, search for inns and pubs in that area and look at their websites to see if they would suit your party of 16, switch to google earth to view likely moorings nearby (indicated by boats along the banks). I spent many a quiet afternoon in the office planning my trips down to the last detail and when we came across a really nice pub at the end of the day - with (reserved) table available the Admiral would remark "that was a bit of luck". In terms of eating I wouldn't say there is an absolute must visit pub and the one I would be most inclined to deliberately plan around is probably the Weighbridge at Alvechurch marina. You could start your holiday in there at lunchtime. For drinking it must be the Vine, AKA Bull & Bladder, in Brierley Hill. A trip to the Swan at Netherton is possible and there are a couple of good drinking pubs in Birmingham. This is of course based on drinking proper beer. Queens Head. Opposite Stoke Pound visitor moorings between Tardebigge and Stoke lock flights. Overpriced and surprisingly popular. In truth the food and beer is perfectly fine and the location is great from a canal perspective. Big beer garden, can be noisy. Navigation Inn, Stoke Prior. 50 yards from Stoke bottom lock which is five locks and about a mile past the Queens Head. Recently reopened. I haven't been but my mum gave it the thumbs up. That may not be the most reliable indicator though. She doesn't drink. Can't be worse than precious incarnation. Boat and Railway, Stoke Works. Half a mile south of Navigation opposite visitor moorings. Unpretentious local pub that has a nice mix of locals and boaters and does ordinary food and beer decently at good value. Bowling Green Inn, Astwood. Short work from canal bridge above Astwood locks. Not far from Boat and Railway. Has appeared to be barely open for a number of years. Visited once about four years ago. Food and drink OK but no one else there all night other than our party of six (and it was Saturday!). Expect to find it closed down every time I drive past. Eagle & Sun, Hanbury Wharf. Adjacent to Hanbury visitor moorings. Carvery. My mum likes it. I am less keen but wouldn't avoid it. Popular at weekends. Fir Tree, Dunhampstead. Moorings nearby. Haven't eaten there for years because it always seemed a bit odd and quality variable. Called in for a drink recently and had a decent pint. Should try it again sometime. Bridge Inn, Tibberton. Adjoins Tibberton visitor moorings. Like a lucky dip. Never quite sure what it's going to be like. Some folk prefer Speed the Plough just down the road. I don't know but have also heard people say they are both much of a muchness. From Tibberton the next places to visit are in Worcester where you have lots of choice of pubs and restaurants. Then up the Severn the pubs seem to be neglecting their moorings or closing. The Camp House below Bevere Lock is an offbeat place that can be fun but the mooring was barely useable last time I passed and even at it's best you might struggle with four boats. You can moor for the night on Bevere lock landing after lock closing time and there is a path to the pub. There are pubs at Holt Fleet and Lenchford but last time I passed the Hampstall Ferry Inn was closed. You won't need to moor between Worcester and Stourport as the river section will be half a day. Stourport has a number of pubs and an Indian restaurant. There are a couple next to the canal. Near the moorings above York Street lock is the Black Star. Kidderminster also has many pubs but generally it's not a town to moor in overnight. The Lock at Wolverley is OK and it's a nice spot. Moorings above and below the lock. No phone signal and the pub wi-fi is useless. Kinver has a large pub by the lock and I suspect better ones in the village. There is - or was - an Italian restaurant in the village. Moorings are below the lock before you get to the village but don't be tempted to carry on past and look if you want to stop. It's a nice place. After Kinver there is a a gap. Nothing at Stewponey any more. If you head down the arm into Stourbridge there will be options but I don't know Stourbridge well. The Samson & Lion is a well known pub by the side of the Stourbridge flight. Then it's on to Delph/Merry Hill for the aforementioned Vine/Bull & Bladder which is the Batham's brewery tap and walkable from the canal. The Swan is another historic pub at Netherton, also walkable from the canal. Moorings possible for both but best locations not necessarily the nearest. If you visit the Black Country museum take in the fish and chips cooked in dripping and have a drink in the recreated Bottle & Glass pub. Birmingham is of course full of places and you really should moor in the centre on your second from last night. From there it's about three hours to Hopwood where there are good moorings and the pub mentioned in your other thread. Then it's an hour back to Alvechurch on the last morning. JP's post is excellent and almost a copy of what would have been my recommendations - I would add the fish and chip shop in Swinden and or Compton if that's on your final route (may not be) Namaste is the "go to" Indian in Stourport, the pub NEXT DOOR to Weatherspoons at Merry Hill, sadly I have to agree avoid Kidderminster which should be so much better BUT it does have 2 v good supermarkets on the canal - please ignore any gossip about Stourport it attracts ill founded bad press but is a good stop and I speak as former land resident - The Black Star is VG. I endorse the previous posts too. I’d also like to add the Anchor Inn at Caunsall too, on the Staffs and Worcs. It’s a short walk from the canal, in the village itself, an unpretentious local pub with a range of real ales and ciders. They serve delicious home made cobs/rolls/batches, generously filled with cheese, beef or ham and served with lashings of salad - lettuce, cucumber and tomato,all at a modest price. If venturing into Stourbridge itself, then can recommend the Duke William, a Craddocks house. Would help if you could give some details on what you like from a pub or restaurant. What sort of drink / food / atmosphere? The we can give better responses. There are loads of places i like on the ring but you might not. Also, see my post on the other thread. I still stand by what I said. Anti-clockwise is a better option, if for no other reason than it solves the problem of the first night. Your other concern is that there's 16 of you. That's going to be a problem for some of the eateries on the route. Either because you'll need to book in advance or because you'll be over-stretching their kitchen. I also think JP's is one of the best pub-oriented posts I've seen on here. I wish I'd had it when we did our 30th anniversary (of canal boating) / Ruby wedding Stourport Ring cruise in 2013. Then I could have avoided the 'pub' at Hanbury Wharf which gave us one of the worst anniversary meals we've had. We then went down to the Severn via Droitwich, which wasn't possible in 1973, but had a good selection of decent pubs. JP was reasonably positive about the Eagle and Sun though. He's too generous. It's crap. I wouldn't describe it as a pub either. I've had some fine carvery meals in the Eagle and Sun. To me it is a good stop for lunch when doing Worcester to Tardebigge or the other way. You can moor for the night on Bevere lock landing after lock closing time and there is a path to the pub. Last time I was at The Camp House by boat we had come down the Droitwich Canal and arrived at Bevere lock after the lock was closed. Spent the night on the lock mooring and were away heading upstream next morning before the lock opened. It's only a short walk to the pub. Whenever I've asked the lock-keeper at Bevere if I could moor for the pub, he's always said yes. He asks if you could turn to face away from the lock and moor at the far end of the pontoon, so other boat know you aren't waiting. I'd agree with all the recommendations above, many are in the cruise report I posted here. Since nobody else mentioned it, in Worcester the Cardinal's Hat is fantastic if you like a real pub with great beer. The best drinking places in Worcester are The Plough and the Oil Basin Brewhouse. If you've come from Canada and would like to see something historic, then The King Charles House. I tried not to be unduly harsh. I don’t want to put off visitors. Also need to curb our own parochial bias considering we are advising international visitors. Read between the lines a little. I was a little disparaging about the Queen’s Head initially but moderated it as I could quite understand why a group of 16 from Canada would find it excellent for a first night meal, particularly if it’s a warm day. I’m working on how ten days might pan out with a few possibilities. I keep getting interrupted by having to go to work though. Even though with a bit of imagination you could combine The Greyhound, Folly, Cape of Good Hope, Blue Bell and Post Office Vaults on the Warwickshire Ring? I quite like the Queen's Head. Yes it's overpriced, but if you've just paid for a flight from Canada, that probably doesn't matter. Plus points: food is decent, drink is decent, it's clean, the garden is nice. Of course, we still don't know what the OP considers to be a proper pub? Maybe he's hoping for a Harvesterspoons at each stop? I'd agree. The Queens is a "posh" pub with commensurate pricing, however, the service, the food and the bar offerings have always been very good in my experience. For those on a budget they have a "happy hour" before 7pm where drinks are relatively cheap and the food is 25% off, plus half price pizzas on a Thursday among other offers all viewable in advance online. Time it well and you can eat and drink very reasonably; time it less well and you can still eat and drink very well, but the price might not suit everyone. 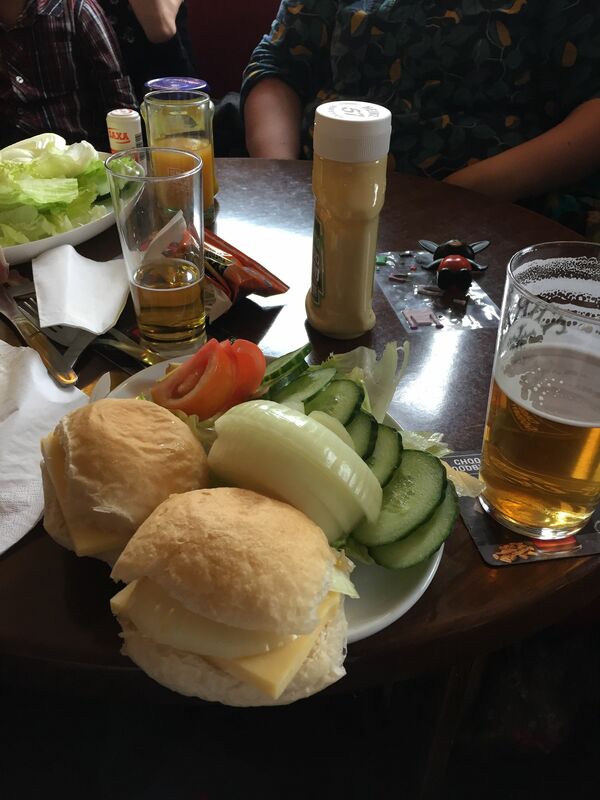 Anyway, later/earlier in the trip, a lunchtime walk to the Bull and Bladder for a cheap but excellent cob lunch accompanied by beer worth crossing the Atlantic for will balance the books for our erstwhile Canucks. The Eagle and Sun at Hanbury Wharf was awful in 2013. Since then, new owners raised the standard by introducing a very good carvery at reasonable prices then promptly left it to less experienced staff to run at increased prices and not quite the same standard of food. They do, however, keep a decent pint, but there's no real bar as such so you're sort of drinking stood up in a restaurant. I'd use it if it fit the plan. The Fir Tree at Dunhampstead is an odd one. I've enjoyed good food and drink in there, but you can catch them on good and bad days from the welcome point of view and they seem to open when it suits them. Not a bad thing from all viewpoints! Time it right and I like it. Tibberton is why I carry canned beer. The Bridge really ought to be a bustling canalside hostelry, but somehow it's a bit odd. If it was OK, I'd have used it a lot because of its position in my cruising area, but I've given it a few second chances and can't be bothered to give it any more thought. I think the Cardinal's Hat in Worcester and the King Charles come to that, are an absolute must for our visitors. They should probably have a sharpener in the former and a Pie and Mash in the latter. In the Charles, I'd look down the hole, listen to the legend and not be too fussy about the truth of it! In Stourport, the Namaste Indian has a £9.95 offer (Sun-Thu iirc) which will make a good evening at very reasonable cost. If they need more drink before or after (or both - I've enjoyed a few drinks with Canadians!) I'd also recommend the Star. The Angel next to the river is in new hands so I can't speak for it now, but it's a lovely place to sit with a pint in the summer. A similar pub in Henley on Thames would be a gold mine! We sometimes detour down the Stourbridge arm, and it's OK. We don't tend to stop between here and Merry Hill - perhaps we're in a rush to reach the Bull and Bladder? Honestly, I wouldn't waste shoe leather on walking from Windmill End to the Swan. Perhaps they were having an off day when we last went but the atmosphere was strange and both of the beers I tried were indifferent at best. I know, I know - to some, it's the best pub in the entire world. Sorry! I'd second the Black Country Museum fish and chips plus a pint in the pub, but a wander to the Fountain wouldn't go amiss. I've never really found any firm favourites in Birmingham, but there's plenty to choose from. The Hopwood well placed for a last night clockwise stop and is now a Marstons pub/restaurant so it's a reasonably priced chain offering. Its fine. Finally, whether for first or last nights, a party of 16 will need to book in advance for the Weighbridge at Alvechurch as they'll almost fill it on their own! Actually, it's practically always necessary to book however big the party - worth it though, I'd say. The Eagle and Sun at Hanbury Wharf was awful in 2013. Since then, new owners raised the standard by introducing a very good carvery at reasonable prices then promptly left it to less experienced staff to run at increased prices and not quite the same standard of food. They do, however, keep a decent pint, but there's no real bar as such so you're sort of drinking stood up in a restaurant. I'd use it if it fit the plan. I'm not convinced. The carvery (which is the only thing they do) is mediocre and hugely overpriced. The Fir Tree at Dunhampstead is an odd one. I've enjoyed good food and drink in there, but you can catch them on good and bad days from the welcome point of view and they seem to open when it suits them. Not a bad thing from all viewpoints! Time it right and I like it. It's not amazing but it's the best best on the canal between Worcester and Stoke Pound, where there are lots of pubs but mainly they are poor. Tibberton is why I carry canned beer. The Bridge really ought to be a bustling canalside hostelry, but somehow it's a bit odd. If it was OK, I'd have used it a lot because of its position in my cruising area, but I've given it a few second chances and can't be bothered to give it any more thought. Yes, see above. I think the Cardinal's Hat in Worcester and the King Charles come to that, are an absolute must for our visitors. They should probably have a sharpener in the former and a Pie and Mash in the latter. In the Charles, I'd look down the hole, listen to the legend and not be too fussy about the truth of it! A peer down the hole is a must, yes. Spotting a fake skeleton is surely a highlight of any trip to the UK. In Stourport, the Namaste Indian has a £9.95 offer (Sun-Thu iirc) which will make a good evening at very reasonable cost. If they need more drink before or after (or both - I've enjoyed a few drinks with Canadians!) I'd also recommend the Star. The Angel next to the river is in new hands so I can't speak for it now, but it's a lovely place to sit with a pint in the summer. A similar pub in Henley on Thames would be a gold mine! Thumbs up for the Angel, as you say a lovely drinking spot. The newly reopened Prince of Wales, The Wellington, The Craven Arms, The Post Office Vaults, The Bull's Head, The Physician, The Victoria, The Jekyll and Hyde, The Woodman, The Joint Stock, The Queens Head, The Rose Villa, The Pint Shop, The Lost and Found, The Sun on the Hill, The Head of Steam, The Lord Clifden, The Shakespeare, The Old Contemptibles. I could go on for ages. But you're in Birmingham so there's lots of other food and drink options to try, swanky cocktail bars, michelin starred restaurant and cuisine from all around the world. Yes the Warwickshire Ring (we visited all those pubs in 2016) is good, so is the Cheshire Ring (2009 and again this year! ), and the Four Counties/Caldon (2014), and HNC/Rochdale (2017), and the L&L (2015) -- but even after much planning of stops with the aid of CanalPlan/GBG/WhatPub/Google the Stourbridge Ring (2018) had the highest "good pub quotient" of all. I think we're pretty well aligned in most of our opinions on the previous post. You say you're not convinced about the Eagle and Sun - I'd agree! They do have an a la carte menu, but sadly the carvery is now a shadow of its former self. I wouldn't go out of my way, nor even stop on my way if there was a better plan. In fact, I walked past it just last week and ate onboard. I did say I like the Fir Tree - you just need to check their opening schedule! Looking down historic holes with legends of royalty and historic battles is just the thing for most "new world" tourists, isn't it? Both that and the Cardinal's Hat are great buildings though, eh, and the fact they serve beer seals the deal for me. Sorry about the Swan: it's how I found it, but I knew (and admitted) I was a rogue point on the graph! I humbly apologise! As for the above - impressive list! I said there was plenty to choose from - maybe I'll find some firm favourites from your recommendations. I'd pick the same first four. The rest would need sorting of the wheat from the chaff. The Contemtibles was a great pub when I was in my 30s but that was a very long time ago; I was last in about 5 years ago and I might as well have been in the Joint Stock.